The USDA’s May WASDE report released on May 9 projected that stocks of U.S. corn at the end of the current marketing year would total only 1.146 billion bushels, about 100 to 150 million bushels less than generally expected. Since the release of that surprisingly small forecast, however, corn prices have declined about $0.40 per bushel. The price decline has come in spite of some supportive fundamental developments. The current pace of ethanol production, for example, exceeds the pace needed to consume the projected 5.05 billion bushels of corn for the marketing year. If ethanol production during the final 16 weeks of the marketing year persists at the rate for the week ended May 9, corn use would exceed the current USDA projection by 25 million bushels. The continuation of historically large ethanol crush margins should be supportive of ethanol production, but the magnitude of ethanol exports relative to imports will likely determine the level of domestic ethanol production over the next four months. Similarly, the weekly rate of exports and export sales of corn continue to exceed the pace needed to reach the USDA projection of 1.9 billion bushels for the marketing year. The market, however, seems to reflect concerns that actual export shipments will fall short of 1.9 billion bushels. Finally, record large livestock feeding margins and low corn prices relative to other feed ingredients should be supportive of feed use of corn. However, feed and residual use of corn is only calculated on a quarterly basis with the release of the USDA’s Grain Stocks report. Since calculated use is not always consistent with feed use expectations, the market is expressing some caution about the June 1 stocks estimate to be released on June 30. The recent price decline appears to reflect a combination of declining wheat prices and prospects for a build-up in corn stocks during the 2014-15 marketing year. July wheat futures prices at Kansas City (hard red winter wheat) have declined about $0.90 per bushel since May 6. The USDA’s May winter wheat production forecast exceeded market expectations and concerns about the impact of extremely dry weather on the size of the hard red winter wheat crop have likely peaked. Prospects for a build-up of corn and total feed grain stocks during the upcoming marketing year center on the U.S. The USDA’s initial forecasts for the 2014-15 marketing year for the rest of the world are for a smaller feed grain crop than produced this year and for a draw-down in the level of stocks. The foreign corn crop is expected to be about the same size as this year’s crop with no significant change in the level of ending stocks. Exports of both corn and total feed grains from non-U.S. sources are expected to be slightly smaller than exports projected for the current marketing year. Projections for the U.S. corn market include expectations of a crop slightly larger than the record crop of 2013, a decline in both feed and residual use and exports, and a year-over-year increase in ending stocks of 580 million bushels. The market was surprised by the forecast of declining consumption and the resulting size of the expected build-up in year ending stocks. Prospects of a record large crop and record livestock feeding margins created expectations of larger feed and residual use of corn next year rather than smaller use. Similarly, the projected year-over-year decline in Chinese corn imports was a bit of a surprise. Some early concerns about the 2014 U.S. corn crop due to a slow start to the planting season have mostly dissipated. Concerns were mostly alleviated by the USDA’s weekly Crop Progress report that indicated that planting progress in the 18 major corn producing states had caught up to average progress by May 11. There is now an expectation that the percentage of the crop planted late will not exceed the average percentage by a significant amount. Timely planting keeps yield expectations high. 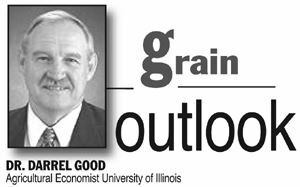 In addition, the outlook for summer weather is generally supportive for crop development. Still, there should be some concern about crop progress and yield prospects in northern growing areas where planting progress was well behind the average pace as of May 11. The USDA’s Acreage report to be released on June 30 will also reveal any acreage changes from intentions revealed in the March survey.